Can I use the dashboard for betting system creation? The dashboard is made up of a series of tick box criteria and numeric boxes. To ensure your search produces an output you must ensure that at least one box per section is ticked (or valid numerical values entered in the minimum and maximum boxes) You must use decimal odds between 0 and 100. If you wanted to find the previous results from horses that were Favourite (or Joint Favourites) running at Windsor, with odds between 1.01 and 4.00 over a distance of 3 miles of less, trained by a specific owner then you can easily specify this from the tick box and odds ranges. This will then produce an output showing the profit of these past races. This will allow you to check for upcoming races that meet the same criteria and create a system based upon this. If you wanted to get data output for races at Newton Abbot for year 2012, you would select the relevant racecourse code (In this instance NAB) within the tick box range. Then select all default criteria for other filters, and tick the relevant year from the filter, you can then either click get results (to display on screen with summary table, or direct to Excel, for an Excel download). There are several help videos that will give you an idea on how to extract data within our how to use page. What does the winning distance mean? Winning distance can be interprested in 2 ways, one way is distance between the horse and the horse in front, the other is distance between that horse and the winner. Prior to 29th March 2017 we used the first option - all data from 29th March 2017 onwards uses distance from the horse to the winner. By clicking "Get Results", you can display the output from your selection criteria and summary tables on screen. Particularly handy if using a tablet or mobile device or you don't want to use Excel. You can use Open Office as an alternative to Excel for data outputting. The limit for on screen and downloadable data rows is 30,000. If you try to download more than 30,000 rows in one hit, Excel will display a message advising how many rows you have tried to download. The issue might also be related to Microsoft Security Update KB3115262 for Excel that was released July 12, 2016. The security update information can be found in Microsoft Security Bulletin MS16-088 - Critical. In Excel Trust Center > Trust Center Settings > Protected View, uncheck the top two options. This is potentially unsafe. Can I compare 2 horses past performance against each other? Using our head to head option from the top menu you can analyse 2 horses performance against each other. Select the first letter of each horse from the drop down boxes and click the "Update filter" box. Then using the drop down menu you can select the horses you want to compare by either typing their name or scrolling to the relevant place. Click "Get results" once you have chosen your two horses and the output for each will be displayed below. You can also use the head to head page for just one horse. Leave the horse 2 filter set to default (none) and it will return all the races of the horse selected from the horse 1 filter. Can I check the jockey / horse / trainer strike rate? In the output table on the main page you can view the strike rates and days since last run for a horse by hovering over the "i" to the far right column of the output table. Pace data is sometimes known as Pace Analysis or Sectional Timing. It times horses at certain parts (or sections) of a race and notes its speed at that point. We only started providing pace data from 11th September 2017. Not all horses have a pace data rating, which is why we include the "Show selections with no pace data" tick box. Pace ratings are from 0-10, 10 being the quickest or fastest. Why can't I see any data before certain dates? As part of our ongoing site and data improvement program, In June 2015 we added 3 additional data criteria to the existing filter and output ranges. OR (Official Rating), Winning Distance, and Predicted SP Odds. This data wasn't available for races before June 2015, so you will need to ensure the "Include horses with no odds information" box is ticked (it is ticked by default). This will allow you to see races for any date period you select despite them not having the predicted odds information available. In October 2015 we added the additional data Headgear (Shows if a horse was wearing any headgear). This data wasn't available for races before October 2015, so you will need to ensure the "None" box is ticked (it is ticked by default). How is the each way profit calculated? By rolling the cursor over the "Profitability explained" area it gives a table showing the breakdown for each way calculation (as below). 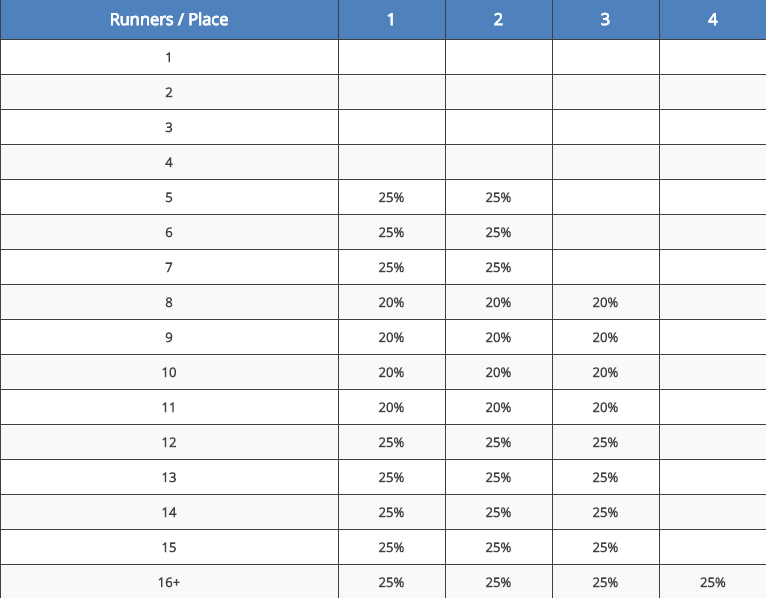 The payout is a % based on the horses finishing place and how many runners were in the race. The summary table provides an overview of the races that have met your desired criteria. The profit / loss figures are the result of backing horses at level stakes (10 units to win and 10 units each way). The yield shows you ROI based on flat 10 unit stakes. This uses the SP odds or Betfair SP odds. The second table breaks down the results based on whether the horse was a favourite, 2nd favourite, 3rd favourite or other non favourite. I have upgraded my account but I still have restricted access to the data? Once you have received our confirmation email advising of account upgrade you should be able to log straight in for full functionality. If you have received this email but still have restricted access please ensure you clear your cookies, or close your browser and login again. It maybe that your session as a basic member is still active. Please log out and clear your cookies / cache as any previous login as a basic member may still be active on your device. If you need to change your password you can manage this via the "My Account" section of the site. If you have forgotten your password please contact us so we can reset it. How is the going determined? Going is changeable, it can turn one way then the other during the course of a meet, and is also weather dependant. The possible combinations of the going run well into the hundreds. We have tried to simplify the goings into 25 separate categories which are typically the going declared before the meet commences. Where the going wasn't available it has been classified as "Unknown". Each going is abbreviated and can be cross referenced to the key on the dashboard page for the full description. A search error may occur if you have not completed the tick box selection (for instance you have not selected any distances, classes or race courses) within your search. In an ideal world we would open our whole site up for free to everybody. The truth is that most months Racing-Bet-Data operate at a loss, and the prices we charge are the lowest we possibly can. The money generated from product sales, membership fees and important advertising funds are re-directed back into the business enabling growth and additional features - so if it wasn't for the funding we do receive - there quite simply would be no site to bring to you, and no additional features being added. On top of the hosting, domain, server and overhead charges we also have to pay third parties for data input and database creation / maintenance, so your membership contributions really do help contribute to the progression of the site. Our data is updated daily at around 10am UK time (please note during weekends or occasions with more races this may be a little later). Why do some selections that met my criteria disappear the next day? If a horse meets the criteria but then is not on the list the next day it is because it was a non runner. In some races there will be at least one reserve horse that will replace any non runners. We do not offer predicted odds or any pre race information for reserve horses, instead these horses will have "RES" displayed in these respective fields. Try cutting down on the criteria you are selecting. It is likely that the report you are trying to generate is huge. If you don't want to change any of your filter criteria, then try filtering out certain race courses or years / months and running more than one search. What race courses are covered? We currently cover over 80 courses shown below. 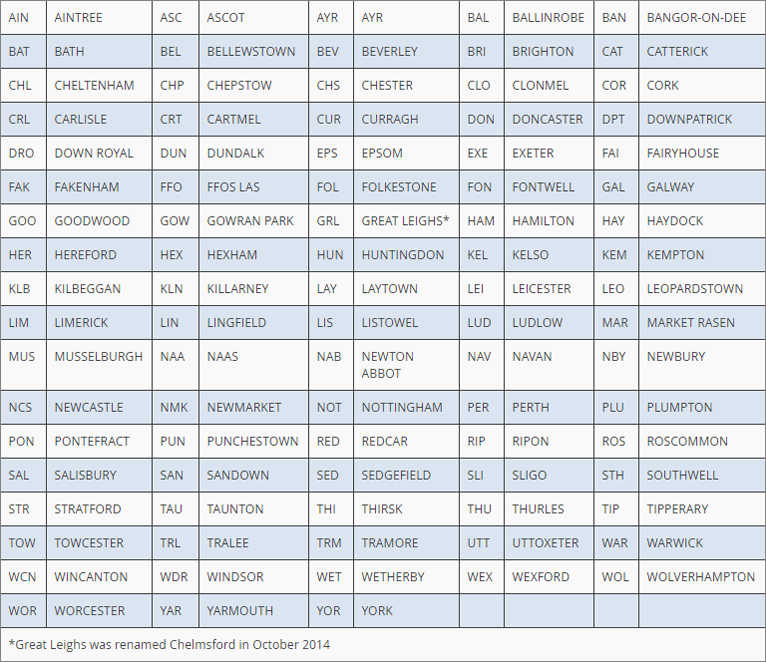 Some of the courses run during the summer months (May to August) so Racing-Bet-Data provides data 365 days a year. You can download the data directly to Excel by clicking the "Direct to Excel" button at the bottom of the filter criteria dashboard. Alternatively, clicking "Get Results" will show the full output on screen including summary tables, and you can then export this to Excel by clicking the "Extract full data below to Excel" button . Within Paypal, you can cancel your subscription via the My Account section. Do I have to log in each time I go to create a search or access archived data? Your session will "time out" after about 20 minutes of inactivity and you will then be required to login once more. If you are using a web browser such as Firefox - the dashboard will have the ability to remember your username / password combination for easy sign in. Yes absolutely it can, and we have many members who run blogs or threads on websites with their selection criteria and upcoming tips. As always with betting though discipline, a good staking plan and obtaining the best odds available are equally important as finding a successful system. It may take you a few attempts and some trial and error along the way, but you will get there. It is also possible to create a "reverse system" - ie looking for losers as you can then create a "lay system" using the betting exchanges. The Industry SP odds displayed in our dashboard and head to head pages are the SP odds (Starting price). The Betfair SP, In Play, and Pre Race odds are Betfair odds. As mentioned in an earlier question, the odds before a race takes place are tissue price odds on the day of a race, and odds displayed after a race were the actual SP odds. The calculation for forecasted odds changed slightly as of 12th December 2018. These remain in the forecasted odds column. Please click the "key of headers" link above the output table, or view our how to use page and videos for a full explanation of data provided. We always recommend you use a UNIQUE password for your logins with Football-Bet-Data and Racing-Bet-Data that are different to passwords you may use for banking, email or other online accounts. Please note passwords are case sensitive and can contain only alpha-numeric characters. Please click the "My Account" option from the top right of the screen when logged in and then enter both your current and new password. Are there any restrictions in the data output? Screen and Excel outputs are limited to 30,000 rows (approximately 6 months) worth of data in one go. Why does the stall data show as N/A or blank? Stall data started being published from 10th March 2019. Any data preceding that date will show as "N/A". Where the stall is shown as blank, it represents a race not run from starting stalls.